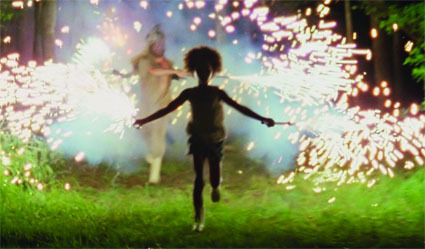 Benh Zeitlin's first feature film, "Beasts of the Southern Wild" (2012), is at times a wonderful and at times a gripping story of a little girl making sense in a forgotten land of trees and rust. It follows in the tradition of movies about happy children running through an unhappy world, in an America we never see on the screen. If she does not steal your heart in the first hour, she will surely grab it in the final thirty minutes. So, if you have your own little Ruthless Gradeschooler her age, then I pity the levees that hold back your tears. 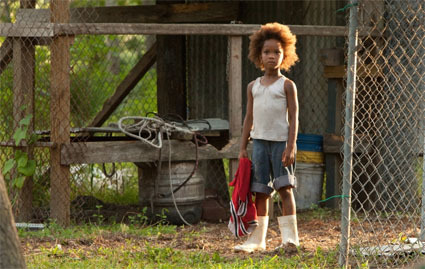 This is the world of little Hushpuppy (Quvenzhané Wallis), who lives with her father on a developing island (named "The Bathtub") just off the scattered edges of Louisiana. When we usually think of "island development," we picture the clanking smoky construction of resorts yielding bungalows, beaches, and boats. But, that is the stuff of fantasies starring accented men dressed in white suits and butterfly collars. Here, however, we speak of melting glaciers that elevate water levels and unleash seismic grumbles, causing land to peninsulas to fragment into archipelagos as stretches of otherwise dry land get submerged. On that note, this film reminds us that the so-called Third World, as we imagine it, exists very much in the First World (also as we imagine it), and seems to hint very loudly that the former will expand. Most American movies feature an America that is either Urban with its tall buildings, business suits, and crowds of commuters, or Suburban with cookie cutter homes, green lawns and grade schools, or Rural with tractors, accents, and churches, or Ethnic with delicious meals and mobsters, or a Beach with sun, bathers, and sharks. Occasionally, we see the Inner-city, with bleak ambition and gun violence. But, how do we describe the Bathtub? 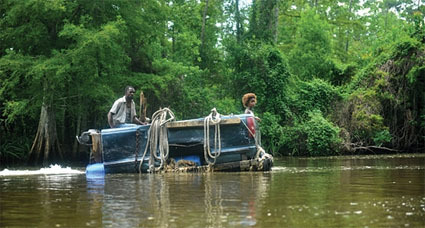 Hushpuppy explores her world with a curiosity comparable to a classroom full of children. Or, perhaps we have gotten so used to sheltering our children according to the dictates of breaking news and actuarial reports that we steam clean the childhood out of our own kids, as though it's something too messy and dirty for life, and we replace it with chicken biscuits and sanitized fish tanks. Not perhaps. Definitely. The first thing that came to my mind, and probably yours, when she used what looked like a dead rodent as a telephone, was the filth and disease. Ok, maybe that is not the best example from the film. Exploring further, in our culture, when we speak of orphans, we speak only of those who have lost both parents. And, in the movies, they usually wander through an adult's world discovering treasures where their elders would fear danger. We are told that their ultimate lot in life is abuse, loneliness, drugs and prostitution. But, what about the little child who has lost one parent? She too is an orphan of sorts. And, here, she too innocently explores a world full of curiosities, explanations, and colorful environments. So, we speak of a little girl who has nothing, but a giant world, and an exhausted father. Her dad, Wink (Dwight Henry), at first repulses you, though he grows into someone uniquely sympathetic. He yells at her. He relents. He initially seems like a hothead. But, he always nurtures her, using an abrasive tenderness that is not quite tough love. Rather, he's giving her some rough energetic parenting to prepare her for an increasingly tough world that she has had to live through without her mother, and might inevitably have to live through without him. He rejects all the trappings and conveniences of civilized life, including electricity, utensils, and even medicine, to give her a primordial experience with the world, for that might be the only experience she can benefit from now and in the future. It used to be that we thought of Louisiana as Bayou country, with its thick, rich swamps, crawfish, and fanboats. Now, we think of it as the abandoned Hurricane zone, in the way we think of Chernobyl and Nuclear fallout. But, this film shows that it is surely not abandoned, even though we get the sense that the world feels the same way about the Bathtub. The rest of the world ignores them, but here, the residents live together with the boundary-less informality of a family. There is no pretense, no pretending. Just life. The world, however, regards them as beasts, composed of nothing more than meat, like all the rest of the animals of the forest and jungle. And, looking at that American movie landscape, perhaps we also imagine an evolutionary scale. At the top (in the film world) are the high rise office executives in business suits in the center of the city. Second, are the suburban families. Then, we find the country bumpkins, the residents of the innercity. And, this film gives the impression that the Bathtub is not the Missing Link, as much as the world wants it to be. When a Hurricane comes to attack, the world sweeps in with nameless uniforms and grabs them all, and locks them in a crowded zoo of white walls and hospital gowns. Rather, the point of this film is that the people on screen, just like everyone else have deep human hearts. That is the nature of life in the Bathtub. Life keeps pounding down hard on you, one way or another. Sometimes it is circumstance, like the death of a mother. Sometimes, the rainstorms force you to hide. Sometimes, the plain uniforms walk in and take you. While all this is happening, the melting glaciers unleash a special breed of prehistoric giant wild boars, which seem to be a metaphor not just for the aggressive power of life, but also the escaping oil in the Gulf of Mexico. No matter what, something will find a way to hit you in life, even if it is a prehistoric monster. 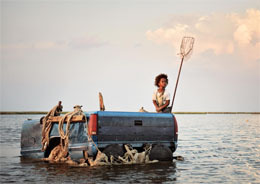 And, that is the key lesson everyone seems to give to little Hushpuppy, from the father, to her makeshift grade-school teacher, to the strangers she meets during a short trek off the island: life will hit you and knock you down, so face it and enjoy it. So, what then is her response? She seems to be ready to scowl in the face of the hungry pack of boars as they roll closer to her, exhaling putrid air from their snout into her steely eyes. But, she seems to reveal something else that perhaps we each forget. Sometimes, the fuel she needs to keep running at full speed, exploring her little giant world, is a simple, quiet, extended, tender hug. Sometimes, that is what each of us needs, a simple hug. In the film, when she receives this hug from a stranger, she whispers something into the stranger's ear, that seems to catch her off guard, causing her to stop, drop, and leave. 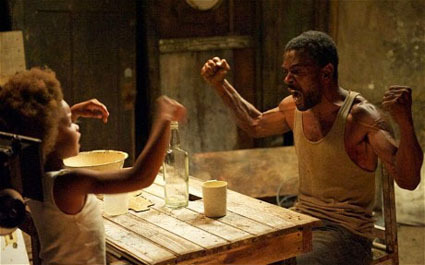 It is not important for us to know what Hushpuppy said, except that we know that when children speak, they speak with a brutally sincere understanding of reality, that we elders have grown used to layering with excuses to help us hide. 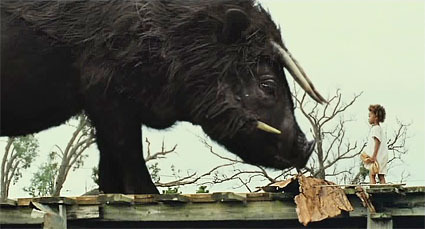 The film's youthful curiosity and ominous threat recalls Alejandro's world in Bahrani's "Chop Shop" (2007) as well the adventures of "Hanna" in Joe Wright's film (2011), and perhaps even Ken Loach's "Kes" (1969). Strangely, in so many of these films, the world we give to our children is an unhappy place of loss. Moreover, this seems, more and more, to be the sentiment of American film. Maybe it's just me, but it seems that our films are growing increasingly somber. Sometimes that is the national sentiment in war time. Or, maybe that gloom is in the air during an empire's final days. Is it just me, or are films indeed getting progressively unhappier? Watching this small community in the Bathtub, I wonder if the film helped draw any actionable attention to the people in Louisiana, still suffering from Katrina. In that way, the film reminds me of Kiarostami's "Zindagi va digar hich," ("Life, and Nothing More," 1992), the story of a community suffering from a massive earthquake. When does life return to normal? Maybe never. Or, maybe normal is just to live life, and nothing more. So, the film seems to tell us that, even after everything in the world comes crashing down and everyone forgets that you exist, life still goes on.